SCVHistory.com | Saugus | Halafax Explosives Co. (Pre-Bermite), Financed by Halliburton, Est. April 1935. 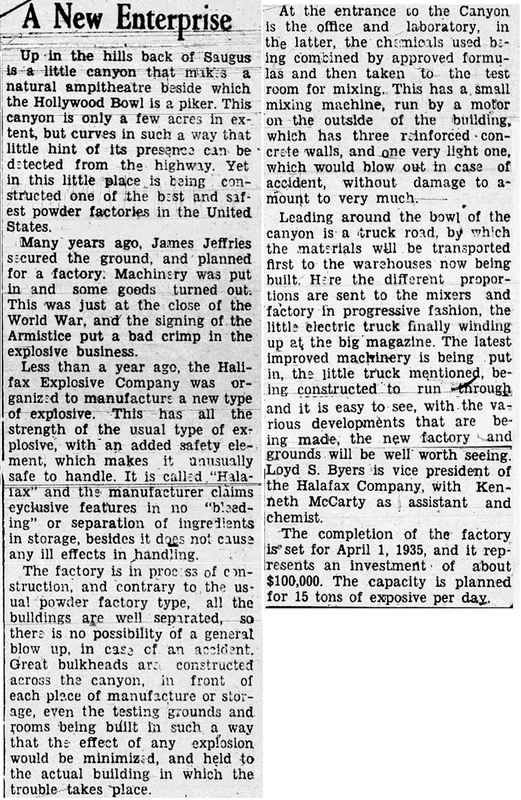 Halafax Explosives Co., Est. April 1935. News reports & advertising, 1934-1936. Click to open full newspaper page in new window. Construction work on Southern California's first major explosives plant, a $100,000 plant in Mint Canyon, was well under way today, according to officers of the corporation. Thirty men are employed in the erection of 13 units, all of them with corrugated iron covering. The plant is the most important industrial announcement since the Hughes-Mitchell plant. The site in Mint Canyon, just back of the Baker ranch, is the sole area in los Angeles county that an explosives manufacturing plant can now be located, because of the requirements for isolation and safety, it was explained. The Halafax Explosives Company, which is erecting the plant, is a recently formed closed corporation, it was learned. Chief officer of the firm is Melville Dozier Jr. of Los Angeles, former state flood control engineer, former manager of the state reclamation board, and former construction engineer of the Southern Pacific railroad. Other officers are Laud D. Byers, of Glendale; Charles A. Neville, of San Francisco, both vice presidents, and Ray Wilbern, secretary, of Los Angeles. Byers is the inventor of a new modern method of powder manufacturing, developed over a period of seven years and approved after exacting tests in all lines of work, it was learned. Plans for formation of the company have been worked out quietly during the past several months, it was learned. Financial backing for the new concern is being provided by E.P. Halliburton, well-known Los Angeles and Oklahoma oil man, who commutes by private tri-motored plane between the coast and the middle western state. Employment will be provided for about 20 men when the plant is completed and ready to start production about February 1, it was stated. Each building will have an embankment around it, similar to oil tanks on large tank farms. News story courtesy of Tricia Lemon Putnam. The same story, with minor editing differences, appeared in the Verdugo Hills Record-Ledger on the same day (courtesy of Don Ray). Up in the hills back of Saugus is a little canyon that makes a natural amphitheater beside which the Hollywood Bowl is a piker. This canyon is only a few acres in extent, but curves in such a way that little hint of its presence can be detected from the highway. Yet in this little place is being constructed one of the best and safest powder factories in the United States. Many years ago, James Jeffries secured the ground, and planned for a factory. Machinery was put in and some goods turned out. This was just at the close of the World War, and the signing of the Armistice put a bad crimp in the explosive business. Less than a year ago, the Halifax Explosive Company was organized to manufacture a new type of explosive. This has all the strength of the usual type of explosive, with an added safety element, which makes it unusually safe to handle. It is called "Halafax" and the manufacturer claims exclusive features in no "bleeding" or separation of ingredients in storage, besides it does not cause any ill effects in handling. The factory is in process of construction, and contrary to the usual powder factory type, all the buildings are well separated, so there is no possibility of a general blow up, in case of an accident. Great bulkheads are constructed across the canyon, in front of each place of manufacture or storage, even the testing grounds and rooms being built in such a way that the effect of any explosion would be minimized, and held to the actual building in which the trouble takes place. At the entrance to the Canyon is the office and laboratory, in the latter, the chemicals used being combined by approved formulas and then taken to the test room for mixing. This has a small mixing machine, run by a motor on the outside of the building, which has three reinforced concrete walls, and one very light one, which would blow out in case of accident, without damage to amount to very much. Leading around the bowl of the canyon is a truck road, by which the materials will be transported first to the warehouses now being built. Here the different proportions are sent to the mixers and factory in progressive fashion, the little electric truck finally winding up at the big magazine. The latest improved machinery is being put in, the little truck mentioned, being constructed to run through and it is easy to see, with the various developments that are being made, the new factory and grounds will be worth seeing. Loyd S. Byers is vice president of the Halafax Company, with Kenneth McCarty as assistant and chemist. The completion of the factory is set for April 1, 1935, and it represents an investment of about $100,000. The capacity is planned for 15 tons of explosive per day. Southern California's first explosives plant opened to the public the week of April 22. At that time Engineers and users of explosives were afforded one of the rare opportunities of inspecting in its entirety a complete powder manufacturing plant. The new plant just completed by the Halafax Explosives Co., near Saugus, California, is now ready to produce a full line of explosives. These range from low strength, free running, to the higher nitroglycerin equivalents. The plant represents an investment of close to one-quarter of a million dollars. Financed by western capital and directed by western executives, the Halafax Explosives Co. is in every way a California institution. Halafax powders are declared by the manufacturers to be the most outstanding advance in explosive chemistry in the history of American industry. By reason of the fact that the explosive is a departure from any previous type insofar as its field application is concerned, preliminary design of the factory units brought to light many problems. As a result, the Halafax factory contains many plant methods and equipment new to the industry. Prior to plant erection, five years were spent in testing Halafax explosives. Most of 1933 was taken up with exhaustive tests in Mexico. Final field and engineering determinations were made in 1934 in the contracting, mining and quarrying industries in California. Halafax powders are declared to be insensitive to sudden changes of temperature, virtually unaffected by freezing and by extreme heat. In common with the gravity system used in other powder factories, the raw material for Halafax powders is delivered to a warehouse and storage quarters located at a point higher than that of any process unit in the plant. From separate material storage to dry batch, thence to explosive mix, shell pack, and on to final pack house, through successive stages, the product is carried by gravity until it is delivered at the lowest point in the plant, the site of the magazine. Display advertisement | Los Angeles Times | January 2, 1936. In a new quarter of a million dollar plant near Saugus, California, the Halafax Explosives Co. is manufacturing the newest of commercial blasting agents — Halafax Explosives. In the past year Halafax Explosives have been introduced, tried and proven on countless jobs — in mines, pits, quarries, roads, streets and surface construction and in agriculture. Because of accomplishments and because of economy, Halafax Explosives have become the most talked of explosives in the field, meeting the most rigid standards of western explosives engineers. If you are interested in securing interesting and important facts about Halafax Explosives as well as details of their adaptability to your problems, write for a copy of the booklet "What is Halafax." Commenting on progress of the Halifax [sic, s/b Halafax] Explosives Company throughout the West since completion of the Saugus plant last April, C.A. Neville, vice-president of the company, yesterday stated that recent sales of explosives to leading western contractors aggregated 2,500,000 pounds. The projects on which these explosives will be used include the Rosa project at Yakima, Wash.; Seminoe Dam and power plant, Parco, Wyo. ; Shoshone tunnels, Cody, Wyo. ; Imperial Dam, Southern California; All-American Canal, Imperial, Cal. ; and Gene and intake pumping plants at San Bernardino and Riverside, Cal., Mr. Neville said. The contractors participating in this large purchase were Morrison-Knudsen Company Inc., Utah Construction Company, Winston Brothers Company, George Pollock Company and William C. Crowell. The Halifax plant, located at Saugus, was completed last April, at a cost of approximately $250,000 and is financed by western capital, directed by western executives and employs local labor, according to Mr. Neville. The explosives are a departure from any previous type in so far as the field application is concerned. The (Bakersfield) Californian | February 14, 1936. Tehachapi, Feb. 14. 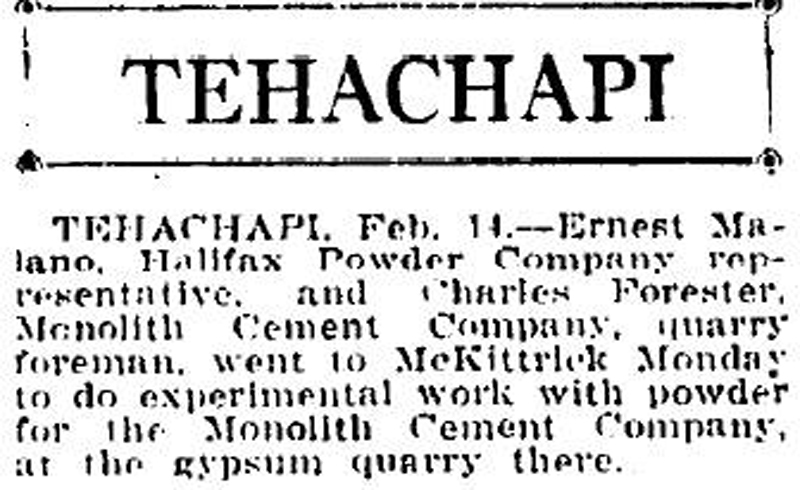 — Ernest Malano, Halifax Powder Company [sic] representative, and Charles Forester, Monolith Cement Company, quarry foreman, went to McKittrick Monday to do experimental work with powder for the Monolith Cement Company, at the gypsum quarry there.